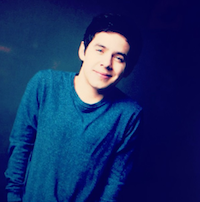 The @davidarchie marketing tour package project is underway. Next-theme and concept! Of course when I read the word “tour,” I flipped … along with probably the 550 other fans who viewed that twitpic). Then I took a deep breath. My dad, before he retired, owned a similar type of company, so I know that a lot of these concepts are created to pitch for work, not necessarily because the contract is a certainty. Still … tour … even as a speculative concept … yessssssssssssssssss. Imagine a whole line of “geek chic” merchandise that celebrates David’s dork-cool vibe and quirky sense of humour. Squiggly pigs here and “hush cats” there … with some of the great pictures from his album shoot used on posters instead of the dark super-serious ones that are there now. "David Archuleta No Sleep 'til Bedtime"
2) Squiggly pig everything (to come in kids and adult sizes, since we know David’s fans range from Build-A-Bear age to 90something Dorothy and beyond), T-shirts, mugs, backpacks, flannel pj bottoms, walkers. 3) “No Sleep Til Bedtime” T-shirts … or PJs. 9) Sundries … hey, Biebster has nailpolish, so why not? So, what do you guys think? Is David’s selection of merchandise okay as is? What would you like to see (either at a show or from DA.com)? 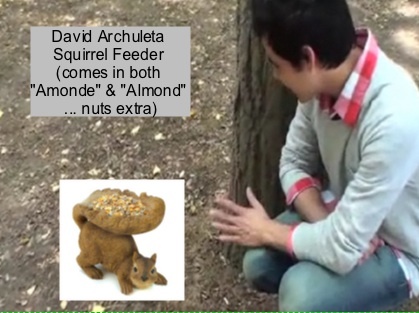 …oh, and do you currently use any item emblazoned with the likeness of Mr. David Archuleta? 🙂 … just curious…. 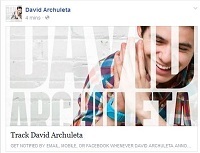 This entry was posted in Utter nonsense and tagged audio books ftw!, David Archuleta. Bookmark the permalink. YES YES YES!!! You hit the nail on the head Deb. I couldn’t care less what the poster-boards or banners look like, I want the wearable merch. 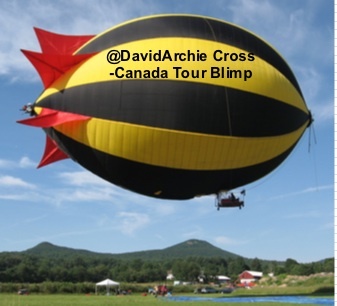 You do not have to go any farther than David’s tweets. I want every red-headed fan to have the opportunity to wear a T-shirt that says: “Ginger. So tasty”. Let’s get this idea to go viral! lol, he would sell a boat load of those! I do NOT think David’s merch is okay as is. He needs a selection of geek stuff (some of these are PERFECT), a couple with his gorgeous visage (they try but they can do even better), and some more graphic approaches, possibly fan-designed. Many stars finance their tours on merch. So far his has impressed me as very generic, like the standard design tees at my local zoo. They could have any name on them. so true about financing tours, Bianca, I wonder if anyone’s explained the value of good merch to D.
They shouldn’t have to. Someone should be taking care of that for him. Can we volunteer? Amazing ideas! I especially love the squiggly pig think. I personally think he should copyright it and use it as his logo. I’d rather have that on my t-shirt than pictures of him that don’t represent him well. Plus, I sort of have a problem with wearing people’s faces on my shirts in general xD Love the ideas! I mean *thing not think, lol! Love these ideas..especially the tweet-T’s. 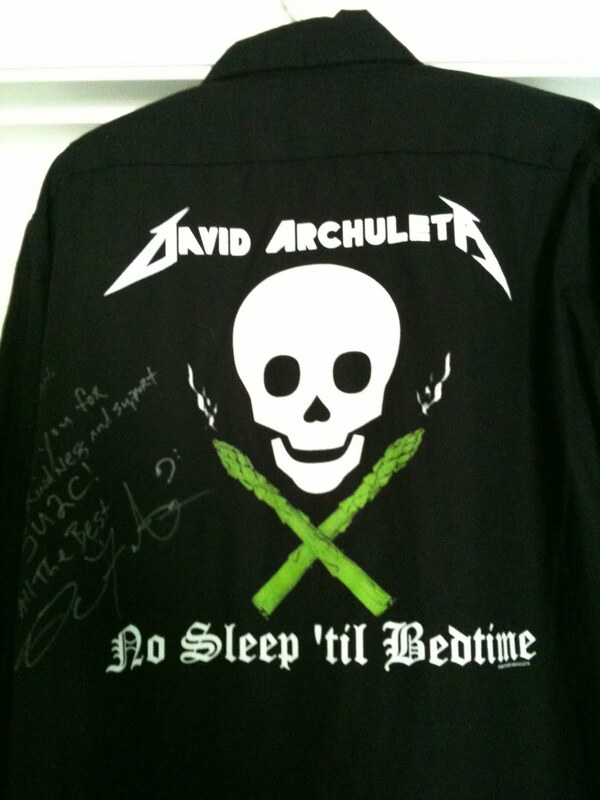 And I would definitely buy David Archuleta “No sleep til’ bedtime” jammies!! Very clever! I actually love the “tweet shirts” ! 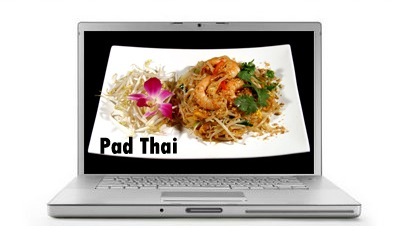 And this is also an idea…. Sigh. Yeah, I’ve violated copyrights a time or two. All the best ideas do. But even worse, that itsy bitsy bit of an orange avatar–vital to recognition of it being the David–is too low-res to do anything with. Love these creative ideas !!!! TOfan: You are incredibly funny and smart.You guys should imail or tweet this whole post including comments to Melinda and Kari.I would if i knew how. First time delurking but regular visitor to your great site. Thanks for de-lurking, Tropical Angel (what a great screen name, btw)! Interesting to hear what you guys would actually like to see! Especially for TOfan’s Tee, today!! Oops, TOfan. My “old” age is showing. 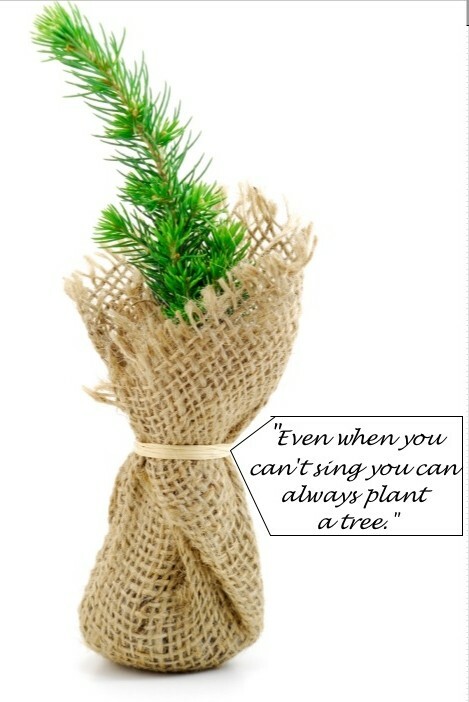 But, you can never have too many good wishes – no matter what the occasion! Thank you for the birthday greeting, as well. I’m in good company with Kizzi and Happy! Nobody in my house is allowed to touch it. I used one at work and people were insane for it. People who don’t even know him. p.s. I would buy a purse with the right tweet on it. Love all your clever, funny and wonderful ideas TOfan! 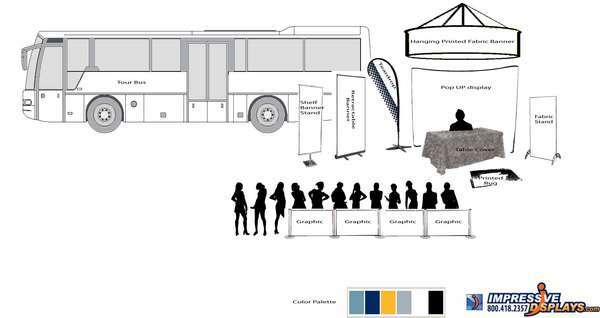 I have always thought there should be a lot more interesting merch at DA concerts and VIPs, etc. Love the tweet wear too and the squirrel feeder, lol….love it all! Could put Almonde on a Tshirt too. Squiggly pig merch….perfect. Would wear one of those Tees. And how about some awesome, current 8 x 10 glossies with David’s beautiful poses or even a fabulous program. You see them at other artists shows, am sure some with D’s face on them would sell well. All comes down to cost I suppose but well worth it. Great post and it gets me thinking (and hoping)…..tour. tofan, looooove your idea! Yep, especially the “tweet-shirts”! And the pj’s, I would buy multiple pairs! He has such creative fans I know you guys will come up with alot of really clever ideas. TOfan – AMAZING amazing post. Wow you are ridiculously funny! 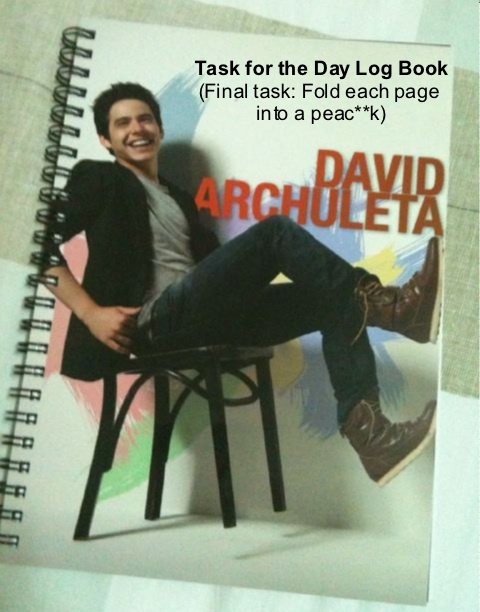 “Final task: Fold each page into a peac**k” Bahahahahaha I actually laughed out loud! Seriously, though, I would love for him to have awesome merchandise. 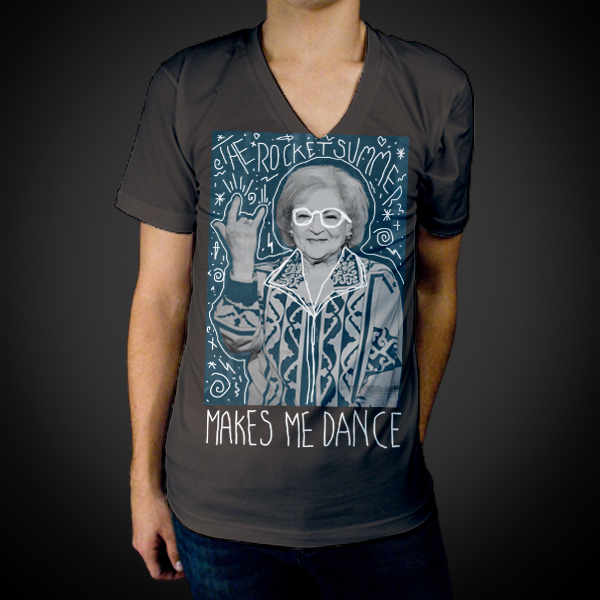 Like cool graphic tees that wouldn’t be weird if I wore in public, haha. He’s young and fun and should have merchandise to represent that! Also I would def wear squiggly pig flannel pj pants! TOfan, tweet shirts are brilliant!!! Leave it to you to churn out so many fun stuff! Love the Task for the Day Log Book! Peac**k LOL. And Pastel’s “Ginger. So tasty.” copy! So funny and fun. Great clever, fun, quirky copy can be key to really cool merchandising, whether it’s on a T-shirt or a mug. The fact that his merch so far has been basically generic or standard looking as Bianca points out has (IMO) to do with design not being valued typically. That is just how it is in general, not just with the merchandising issue. That part gets skipped because it is not considered difficult to marry type with an image. Anyone can do it, easily. But badly. LOL. I hope that as David progresses in his career, he will involve himself a little more in areas that are not directly related to music but that are important to the business side of it. He needs to be the one to approve how his image gets used or produced in the way he was more involved with the TOSOD CD photoshoot. Look how great that turned out and he is happy too! vermeer, you are so right about design not being valued these days … it seems technology has fooled many into thinking it can replace designers, writers, photographers … even musicians and singers! I’m really hoping the pendulum will swing back the other way soon! Thanks for the birthday wishes TOfan and the slice of cake! 😀 And happy BD to Happy and Bluebar, my fellow Aquarians. Brilliant ideas as always TOfan. Your creativity is a never-ending wellspring. It would be fun to see merch such as “Hush Cats” slippers, Page-A-Day Calendar cube with his tweets or a Page-a-Day with his tasks for the day, and, oh, let’s see…a microfiber or organic cotton throw blanket with themes like tweets or squiggly pigs. Tweet wear…. what a great idea and it would SELL, imagine that! Quirky and fun with a little dork thrown in…perfect. These are seriously great ideas…..if only TPTB could catch on. David needs to make good money on merch, so that he can tour forever. Happy Birthday hugs to Kizzi, Happy and Bluebar 🙂 Enjoy your day! Forgot to say…… yes please to the audio book, with extra stories and LIVE CONCERT recordings>>>Ay carumba, that would make me happy, if our singing snowbird can do it …. David can toooo. You have followed in your father’s footsteps that is certain. 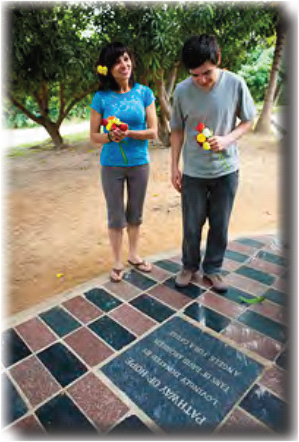 Those footsteps have led you to make this creative site and you defintaely are giving something to David every day. I try dang hard to do the same in an article once in awhile, but you have the creativity going on all of the time. You know, there are David admirers (a more classy word for fans) who have such terrific talent that they could send anyone’s career to the moon and back. 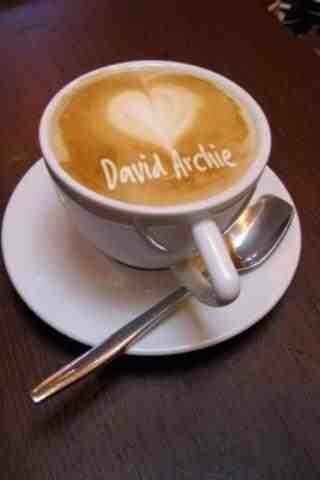 I know that you (and your David friends) could create fantastic merchandise for David and I also know that if someone sees this merchandise they may copy you but then whatever it takes! There are so many creative artists, photographers, writers and designers in his fanship that I know they will all play a part in his wonderful career. That’s just me dreaming saying that. Happy Birthday to Kizzi, Happy and Bluebar and everyone else who has a birthday!… A birthday cake sounds wonderful on a winter’s day! You have an amzing creative mind Deb:) Oh, I see someone’s Bday..Happy bday to Kizzi! What a great post! 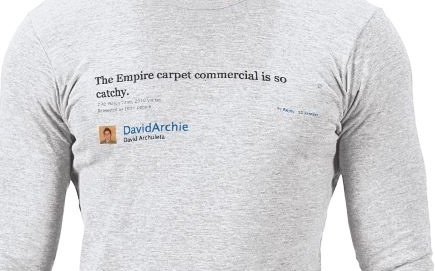 I think if there were t-shirts or bags with David’s epic tweets on them, they would SELL OUT! LOL! Love this post TOfan. 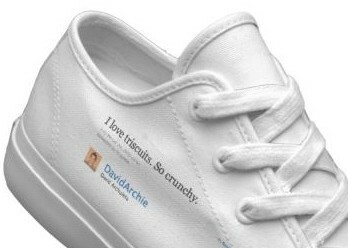 I want me some tweetwear sneakers NOW! This idea is briiiillllaaaannntt!! TOfan, I’m still in awe of your clever, funny, brilliant post here. That Matt Clayton photo would most definitely make a great poster shot. Love Matt Clayton photos, this one is no exception! 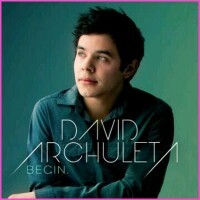 No one can say that David looks 12 yrs old in that picture. please take a look @davidarchie – if you’re not following this guy you are missing something pretty special … he may be the next “Elvis”. lol, too funny, abanana … if she’s watching that random video, I’d say she’s already a goner! 🙂 Now, if we can only get him over the border!!!! Working my way through insomnia tonight, giving me plenty of time to comment on these brilliant ideas. Heck, I drop in every day and I am still remiss in not saying “thank you” for the beautiful articles on India by both you and refnaf. Enjoyed more than once. Geek Chic: There is all kinds of cleverness going on here, further proof that David has fans who are teeming with talent. 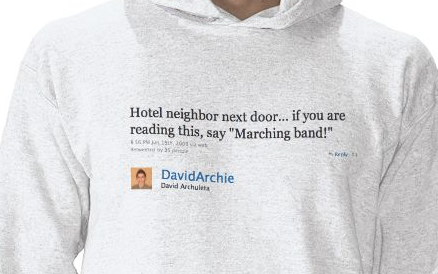 The tweet merch is genius and unique to David, to say nothing of the fact that there is a virtual library of quirky quotes already available for a variety of useable, wearable products. I would buy them, I would gift them; and it is probably taken for granted that I would talk endlessly about them. I have made my own one-of-a-kind stuff, and I have received similar gifts from family and friends. I do use them, primarily to help placate my ODD. However, most of it falls into the DDB category vermeer mentioned (design done badly), with the exception of missbianca’s expertly crafted squiggly pig pin, which I cherish. I can see cool people everywhere embracing dorkiness. Now, how do we push the “geek chic” concept to the right parties? P.S. Dang it! I just noticed that I missed saying “Happy Birthday” to Kizzi. (Happy Belated Birthday!) Sorry. When one is old and slow… Well, one is old and slow. “Teach your children well.” (good song) Just wanted to talk about kids and the fun spirits that they are. Wanted to just make it a little fun today haha. Let me know if you guys have any funny stories about kids. Also got to go to a wrestling match to see one of my friends which was cool. Hope I am getting better with keeping up with blogs so far. LOLOLOLOLOLOL – embrace your inner “kid” FTW!!!! The YouTube comments are fun to read…. Lots of comments about his eyes. 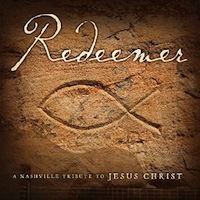 Good stuff!!! Big smiles!!!! And, now my friends it’s time for some seriously rockin’…. ZERO GRAVITY….